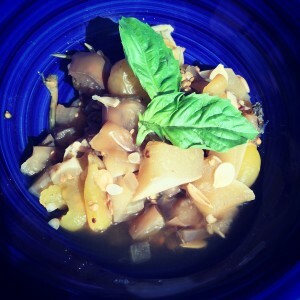 This is a great easy side dish that goes with everything! And it only takes two ingredients to make it. Are you ever in need of a quick and easy side dish? This vegetarian option only takes TWO INGREDIENTS and cooks on low for about four hours. It also goes with just about anything, so there’s no need to amp it up with crazy flavor– just dump it in an hit start. The prep work for this dish is less than five minutes if you start with a whole squash— or about 30 seconds if you buy it already prepped. Now I’m a big fan of doing things yourself… I buy whole mushrooms, not the sliced ones, because I don’t like the brown edges. I buy the pineapple already cored because otherwise it looks like a porcupine and I don’t want to get pricked. And let’s not even move to the meat department and the ease and efficiency of getting chicken that is already boneless and skinless! But I digress. My apologies. Back to making things easy– I often buy butternut squash that’s already been prepped. It’s fresh and easy and pure in its raw state; it just has the seeds and skins removed which is actually sort of a difficult task to accomplish. You can try something like this to peel it, but it’s a challenging task, especially on a Monday! If you want to prep it yourself, that’s fine… the measurements are still the same. Plus, with only two ingredients, you don’t really to be too precise. Put both ingredients in the crock pot, cook on low for 4 hours. That’s it! You will never think of prunes as old people food ever again once you taste this delicious pork! A few years ago, my husband and I went to France to celebrate our anniversary. It was an amazing adventure and I am forever grateful to everyone that helped coordinate taking over our daily chaos so we could get away. We loved the wine and the micro-brews, but what we found most delectable was the food and how the regional influences changed the flavors depending where we were located. It shouldn’t be too much of a surprise– from coast to coast, America certainly offers different flavors and flare when it comes to regional cooking, too! So I’m going to create two dishes in my crock pot that mirror some of our favorite dinners that we experienced. Unfortunately, I can’t run over to the boulangerie and grab a baguette for dinner and some croissants for breakfast, but I’m still pretty certain that I can recreate some of the tastes while building new memories as well. Take a quick trip to France with this delightful dish! As it turns out, I’m not sure that the combination of pork and prunes is really particular to France. I think that Italy, Scandinavia and other places in Europe also do this dish well and vary the ingredients just enough to claim it’s origin! The most challenging part of this recipe is preparing the pork. So let’s go step-by-step through it. First of all, rinse of the tenderloin and pat it dry. This isn’t a marbled cut of meat, most of the fat is attached to the outside, including a membrane that might appear cloudy. Remove the membrane (go on and grab it and pull it off) and cut off any excess fat. In order to stuff the tenderloin, you need a hole through it. The easiest way I’ve found to do this is with an apple corer. Not kidding! Lay the tenderloin flat and cut my tenderloin in half. Skewer the meat with the apple corer and pull out the perfectly cylindrical meat tube. YES– this is totally gross, but totally easy. You might need to core the meat from both ends in order to have a complete tunnel. I couldn’t get a picture of doing this, because both my hands were covered with raw meat and I couldn’t grab my phone. It seems like there isn’t enough liquid in this recipe, but it’s ok. The meat, the prunes and the onions all release enough liquid to keep moisture in the pot. If your crock pot tends to cook hot, then be cautious before going over 4 hours– you don’t want the meat to dry out. 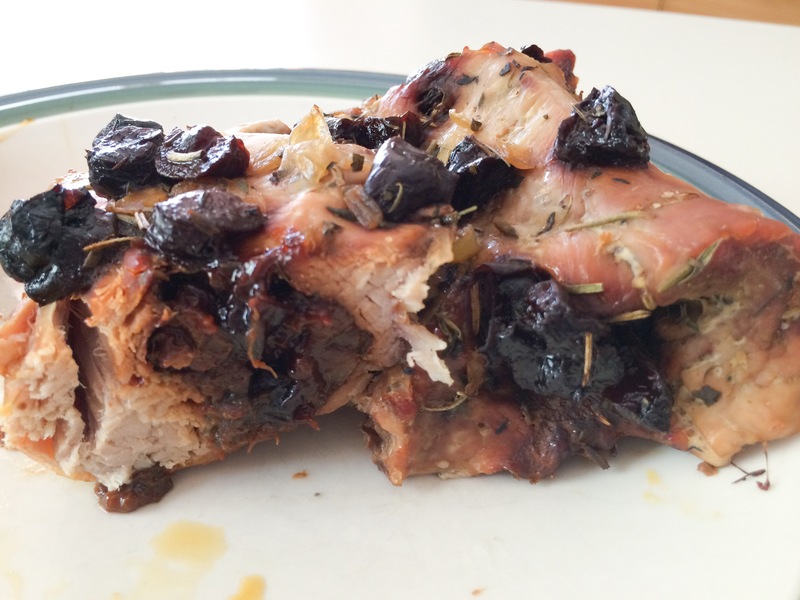 It just takes a few easy steps to create a tunnel in the pork tenderloin and prepare it for the prune stuffing. Prep tenderloin by removing membrane and excess fat and then slicing a tunnel through the meat with an apple corer (see directions above). 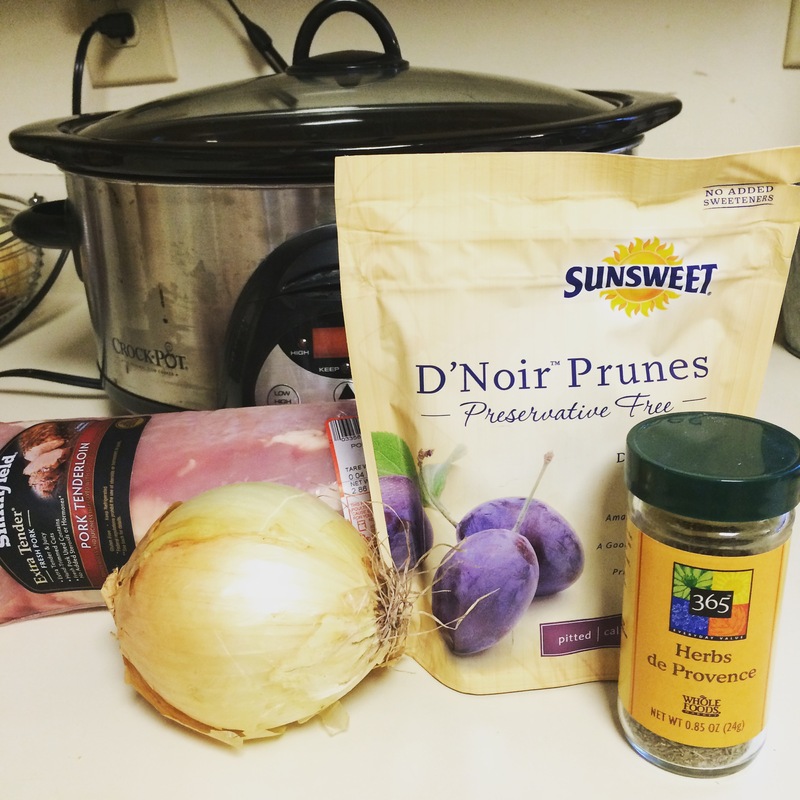 In a bowl, mix prunes, onions, and seasonings. Stuff mixture inside tenderloin. Place tenderloin on rack inside crock pot and top meat with any remaining bits of the mixture. Cook on low for 4 hours or until meat is cooked through. 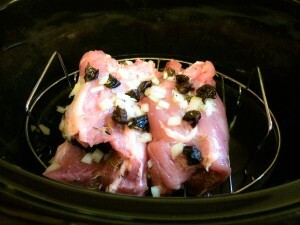 Remove rack from crock pot and let meat stand for 5 minutes before slicing. I was walking through the produce aisle this week and excited to see all of the fall produce slowly emerging as the weather starts the cool and the crock pot starts to heat. With squash of every size and variety piled up like presents under a tree, I started loading my cart with butternut, acorn, and spaghetti squash. But the tipping tower of treasures presents a second issue– how do you prepare and cook these ridiculous looking vegetables? As with most foods that I don’t want to fret about, I make them in my crock pot! 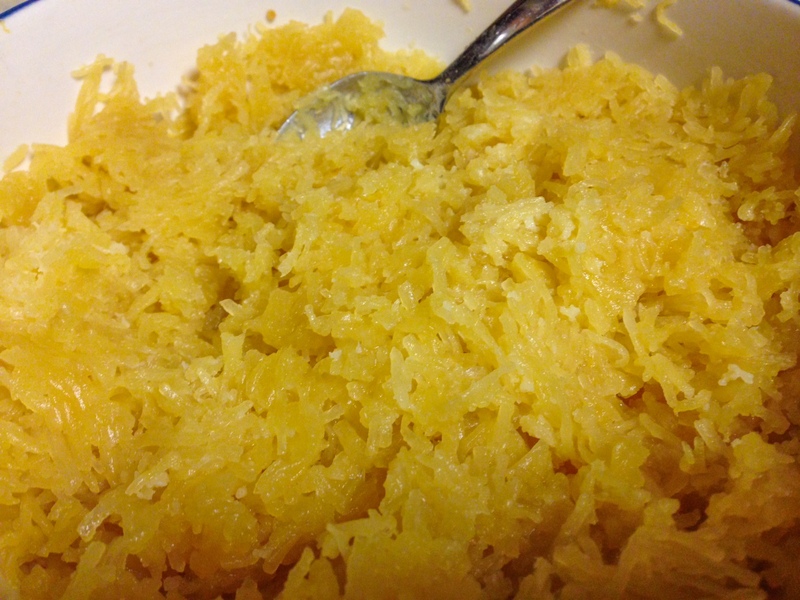 If you haven’t ever experienced spaghetti squash, you are about to be delighted. I’m pretty sure it’s the best diet food ever since it’s low in calorie, gluten-free, dairy-free, paleo-friendly, vegan, vegetarian, nut-free, guilt-free, and packed with nutrients and flavor. But what intrigues me most about this cavern of goodness is the bizarre pasta like consistency of the meaty threads. Here’s the prep: waaaaaash the squaaaaaash. I love that you just sounded that out. Seriously though, this thing it going to sit in it’s entirety in your crock pot all day, let’s not harbor fugitives like bugs or germs. Then take a sharp knife and stab the squash 5-6 times so that the heat and moisture can seep in and out to cook the flesh. Yes, it’s a vegetable, but I think you can use words like meaty and flesh to describe never-living creatures, too. Add 1 tablespoon butter, 1 teaspoon minced garlic and 1/4 cup grated parmesan cheese. Add 1 cup alfredo sauce, 1 lb. browned ground beef and a can of stewed mushrooms. Oh look- beef stroganoff! Add a scoop of crock pot caramelized onions and some cubed mozzarella cheese. French onion spaghetti squash! Trying a new vegetable dish is no longer a challenge or a disappointing dinner. 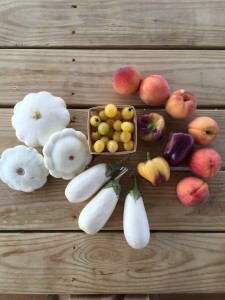 Enjoy your local seasonal vegetables in these new and exciting ways. 1. Chinese New Year was on Monday and I forgot to order takeout. 2. I’ve been trying to do at least one meatless meal each week. 3. 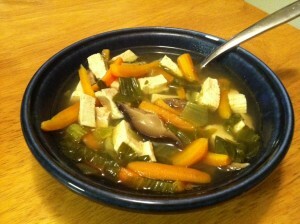 Hot and sour soup is amazing for clearing up a stuffy nose and a winter cold! As with all my soups, I like more “stuff” than “broth” so my hot and sour soup is more crowded that what you get at a Chinese restaurant, but I think you’ll like this as a full meal and not just an appetizer. Plus, it can be made completely vegetarian and I think it’s gluten-free, so this is a great dish if you are cooking for people with food limitations. Put all ingredients EXCEPT TOFU into crock pot and stir into mixed. 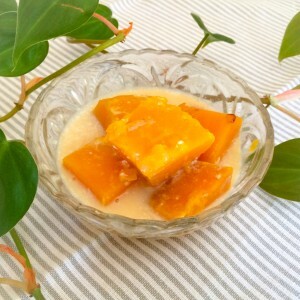 Cook on high for 3-4 hours (or until carrots are soft enough) then add cubed tofu and cook for one more hour.